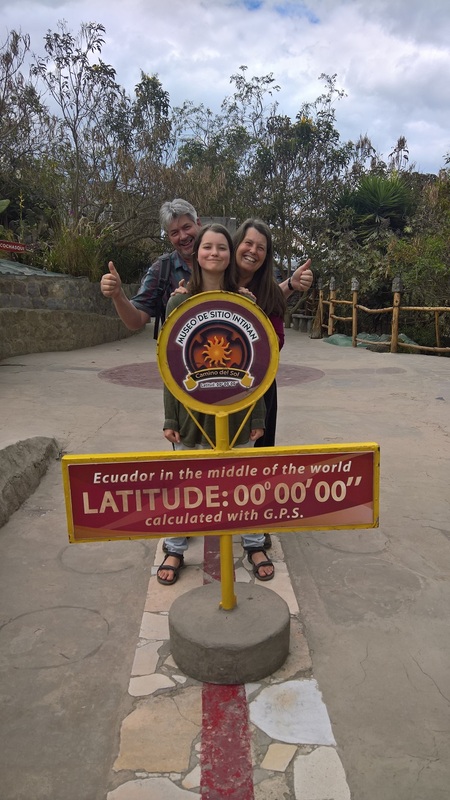 One last tourist attraction; el Mitad del Mundo; the middle of the world. The Equatorian line. The first (very vague) picture we stand in front of a statue that depicts the way the indigenous dress up to make fun of the Spanish conquerors and the Catholic Church (the 12 apostels on top of the head). 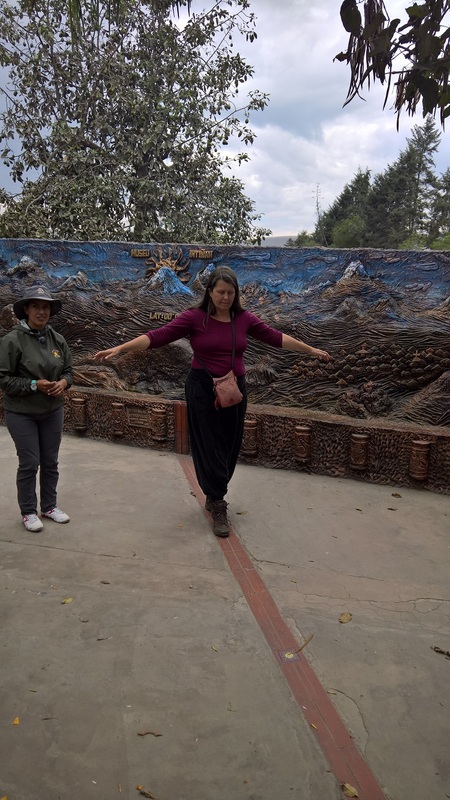 The second and third picture we were asked to walk on the exact equatorial line with our eyes closed, so we could feel how many forces were pulling us from left and right. Nobody managed to walk straight there. 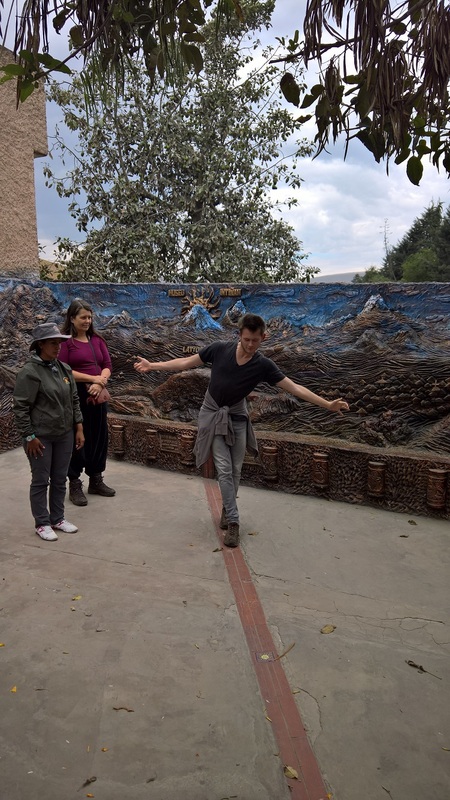 It was very interesting to see that the gravitational forces were lowest there and how water turns one way North of the line and another way South of the line, when running down a drain. The guide (the first non-religeous Ecuadorian we met) told us the sad story of how all the Inca pyramids were covered in chuches and palaces by the Spanish. And the people of Ecuador only learned this truth a very short time ago. The Inca had the same uncanny abillity as the Egyptians to make the large stones exactly fitting on each other, with no spaces in between. 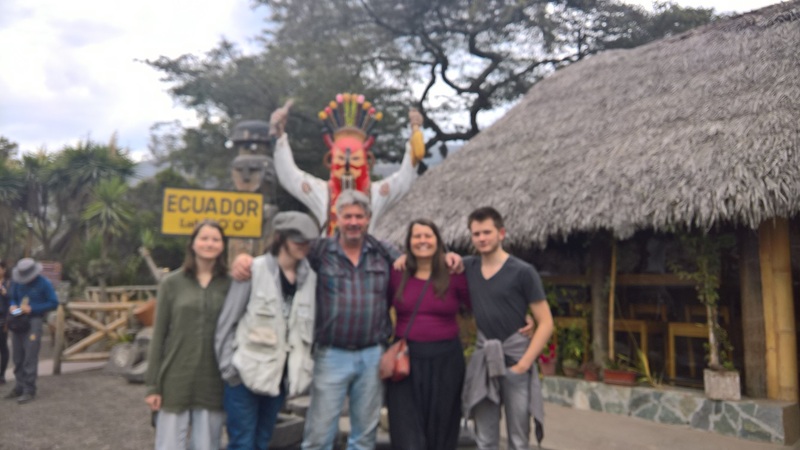 This will be the last blog written in Ecuador. The last. And we can't wait to leave. Partly because we are in an airbnb appartment where they are doing construction work right above our head (?!? ), pieces of ceiling come falling down and we have to yell to talk to each other. It makes the whole apartment shake. Apparently it will get less noisy after tomorrow. Partly because Quito is a noisy and polluted city and we've seen most interesting things last year in September. Partly because we have just 'had' it with Ecuador. That sounds terrible probably. But it's true. The landscape is beautiful (although they chopped down far too many trees, which causes desert to emerge here and there). The climate is very diverse, so you can take your pick in what suits you. A lot of people are very friendly, but an equal amount of people hate gringo's (which we are considered to be). In New Zealand we were looked at as 'Pakeha's' (means non-Maori) and were considered, because we are clearly not Maori, to be part of the conquerers. Which -in a way- we are, since a Dutch guy discovered NZ (which is why it has the name 'Zealand' in it; he was from Zeeland, a province in the Netherlands). After that, the English invaded it and instead of killing the inhabitants (like they most likely did in -for instance-Tasmania), they put them up against each other. I totally understand the anger of the Maori people against Pakeha. And somehow I got carried away into feeling guilty for being white and therefore apparently a conquerer, when living there. In Australia the Aborigine's seem far too defeated to be angry. They feel 'lost'. There seems to be no guilt whatsoever in Australians for what they've done. Maybe that has slowly changed now, but in NZ 'guilt' is in the culture. In Australia it isn't. So I did not feel 'looked at' in a certain way there. Eventhough I felt very bad for the Aborigine's. It is strange to be looked at in a certain way that you can't identify with completely. I had a German friend in NZ. She told me this story about guilt: One day she was at the beach with her daughter. At some point her daughter started playing with the daughter of people sitting close by. She got into a converstion with the parents and found out they were Jews. This made her feel extremely uncomfortable. She hoped her daughter would remain very friendly towards their daughter. So she sat there, on the beach, hoping the day would pass soon and she could go home with her daughter before something untoward would happen. I suppose that -in a way- I feel guilty for being born in the Netherlands as a white person. On the side of the globe where all the money is found. I feel guilty about my Dutch ancestors who sailed over the world and subjected other cultures everywhere. Guilt is not a functional emotion. It will not get me anywhere. But it isn't as easy as it should be, to let it go. And since I find it hard to be confronted by it, through people who dislike me because of the way I appear to them, I rather just leave. Eric feels totally no guilt whatsoever about these things. He thinks the gringo haters are ridiculous, which is his reason to want to leave urgently. I wonder how this will be in Spain. We feel sort of suspended in space (again?). Not having a clear goal (except for leaving Ecuador and arriving in Spain), not knowing why, how, what? The only direction in this void is the line Nikki and JF threw at us when they proposed to us to start something in Spain together. I can feel that line sometimes very clearly and sometimes very weakly. And following this line is better then hanging in a void, but is it the right path? No way to answer this, except for experiencing it. I guess I feel betrayed by my meditation-guidance. Eventhough it all was probably extremely functional, this whole Ecuador-escapade. Maybe after my death -if my consciousness does continue, which you can never be certain of untill you experience it- I will understand this crazy path. And it is hard to see if we are actually moving forward, or just repeating something over and over. Yes, lots to contemplate while the noise above us drowns out the possibility to converse. A friend from Australia told me that she has experienced these void-periods as well. And she says they usually precede a transformation into something new. A new way of perceiving the world, a new goal, new surroundings. I don't believe anymore there is a 'right place to be'. Any country can be the right one (even the Netherlands). I do believe that time plays a role. When the right time has come, things will role. So Spain doesn't resonate with me, but maybe the right time has come and maybe that will make things 'role' over there. Or anywhere. Rest assured. We have less tension between us then we've had in the first 15 years of our relationship. In fact; we have never been as close as we are now. That said; we do have different coping mechanisms (we ARE very different in everything-couldn't be more opposite) and we know this from each other. We can laugh at it and sometimes we are (extremely) irritated by it. But in a strange way it only brings us closer together. Sometimes I get all sentimental about the fact that we know each other so well and still find out new things about the other and the relationship, regularly. To grow old together is something very special. And something we never thought we would experience. I abandoned the idea of ever seperating 5 years ago (yes, it took that long). My parents are divorced and I saw many long term relationships strand when I was young. I lost all faith in long term relationships. As expected I never managed to hold onto a relationship for more then 2.5 years. When I met Eric, I was sure we would not stay together very long, either. I was always ready to end our relationship. I had a terrible fear of being left or betrayed, so I was focused on being 'first' to end it. Eric is also a very proud person, but thank God he is more inclined to choose love over pride then I ever was. We have been on the brink of seperating more then once. That changed about 5 years ago. No idea how it came about, but it suddenly dawned on me that divorcing would not solve any issue within myself and between us. And I decided I wasn't going to take this way 'out' anymore. It became clear to me that we were both trying, we were both good of heart and trustworthy and that we both wanted to make it work and were not afraid to work very hard on it. Other then that, I don't know many men who are as courageous as Eric when it comes down to looking at yourself. So which man could ever compete with that standard for me? Also; there are still a lot of things we can improve and will improve and I love the prospect of working on them. Since then I have never doubted 'us' and the thought of divorce never entered my mind anymore. We will solve any issue. And thats it. I wouldn't want any other person next to me in a relationship (no, also not Sean Connery, Bruce Willis or the guy who plays the young Xavier in the Mutants movies). We can handle anything together. I think that has become very clear with all the emigrating and stresses of the last years. So if I write about me having a terrible day and our coping mechanisms colliding, from now on I hope you can put it in light of what I wrote here.